Oklahoma: As you move from southern to northern/northwestern Oklahoma, wheat ranges from past flowering to flowering to heads emerging/approaching flowering (depending on variety and planting/emergence date). It is highly variable. Weather continues to be cool and moist except in southern, western and northwestern Oklahoma where it continues to be dry. There were no reports of leaf rust over the last week in Oklahoma, but reports of stripe rust increased. However, none of these stripe rust sightings indicated a widespread, severe outbreak anywhere in the state. Bryan Vincent (Crop Consultant – northern Oklahoma) reported seeing strip rust on Everest wheat just west of Orienta, OK (about 40 miles west of Enid). Dr. Brett Carver (OSU Wheat Breeder) reported in his visit early in the week to his breeder nursery at Lahoma (north central OK – 10 miles west of Enid), that, “35 swipes, just one 1″ sporulating Yr lesion at Lahoma, f-3. Otherwise nothing. Will keep looking.” On Friday (10-May) at the Lahoma field day in the variety trial, I found an occasional active stripe in expected varieties (Pete, Garrison, Iba, Everest, and Armour), but these stripes were rare – only one or two per plot. However, our weather over the last couple weeks and the near forecast is for weather favorable for stripe and leaf rust, so we may begin to see more of these rust diseases. Powdery mildew continues to be found but I have not seen it yet on flag leaves or even F-1 leaves. Leaf spotting diseases (tan spot, septoria, stagonospora) are more severe in Oklahoma than typical but vary by location. For example, Dr. Jeff Edwards (OSU Smalll Grains Extension Agronomist) indicated that at his variety trial at Chickasha, leaf spotting was widespread, severe, and was on the flag leaves of specific varieties in the trial. Regarding viruses – barley yellow dwarf is commonly observed at all locations, but is not associated with severe stunting indicating a later infection. Numerous reports have been received and many samples have now tested positive for wheat streak mosaic virus from many areas of Oklahoma. None of these samples have tested positive for either High plains virus or Triticum mosaic virus. Arkansas – Dr. Gene Milus, (Professor/Small Grains Pathologist, Univ of Arkansas, Fayetteville, AR) 10-May-2013: Most wheat has flowered or is flowering now. I found a low level of leaf rust at Rohwer in the southeast corner, and this is the first confirmed leaf rust here. Stripe rust is still active. Bacterial streak showed up on several varieties in the variety test. Leaf blotch is moving up the plants. There is abundant soil moisture across most of the state. Kansas – Dr. Erick De Wolf (Professor/Small Grains Extension Pathologist, Kansas State Univ, Manhattan, KS) 11-May-2013: The wheat is heading and flowering in southeastern and south central Kansas this week. Wheat in central Kansas is mostly in the boot stages of development with the most advanced fields beginning to head this weekend. The wheat in southwestern KS continues to struggle with drought and freeze damage and growth stage varies widely among fields. Disease scouting this week suggests the risk of severe rust epidemics remains low in Kansas this year. I had a few more reports of trace levels of stripe rust in southeastern KS where the wheat is flowering. The levels of stripe rust are very low at this time. Temperatures are forecast to reach the upper 80’s early next week with low temps at or above 60 F. Temperatures in this range often slow the development of stripe rust but farmers in this areas should monitor the disease carefully. I was able to find a single pustule of leaf rust in Stafford county Kansas this week, but the wheat at this location was thin from recent dry conditions. I suspect the leaf rust will not increase rapidly at this location. Other fields that I checked in southwest KS (Finney and Kiowa counties) show significant drought stress and no sign of rust. In south central and central Kansas (Pratt, Reno, and McPherson counties), the wheat is in better condition with thick canopies and good moisture recently. I found no leaf rust, stripe rust or stem rust in these areas; however, several fields had moderate levels of powdery mildew. Symptoms of barley yellow dwarf remain low or absent in all fields I have check to date. By osuwheat in Bob Hunger, disease, wheat on May 11, 2013 . I raise certified seed wheat and have had a couple of customers ask me about the tips of the flag leaf on duster turning yellow. Is this a disease or freeze damage? I have’nt noticed that on my duster but I sprayed a fungicide on my wheat 2 weeks ago. 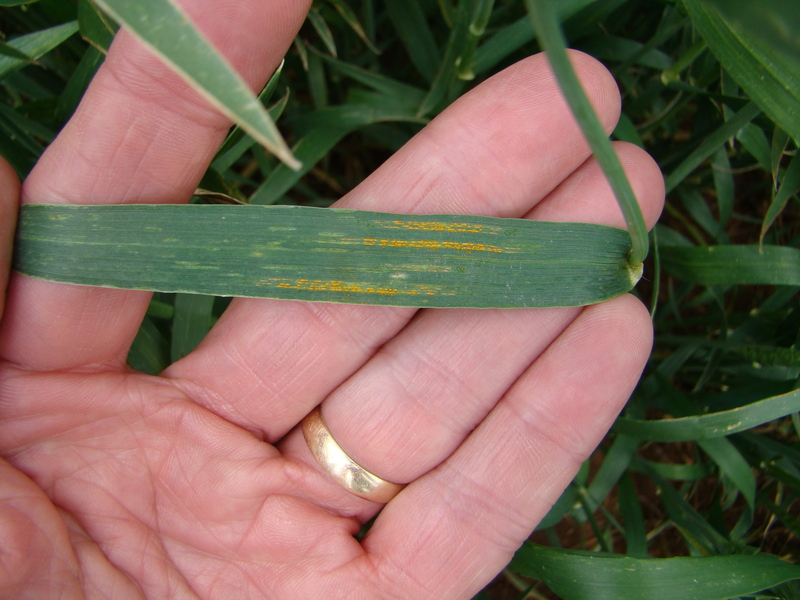 The phenomenon is known as leaf tip necrosis and is associated with the LR 34 leaf rust resistance gene. It is common on Duster, 2174, Centerfield, etc. It does not seem to have any affect on yield and fungicides should not affect it; however, we are dealing with a biological system, so it is possible that the fungicides might have somehow prevented it.